Major Jackson is the author of four collections of poetry: Roll Deep; Holding Company; Hoops; and Leaving Saturn, which was awarded the Cave Canem Poetry Prize and was a finalist for the National Book Critics Circle Award in Poetry. His poems and essays have appeared in AGNI, American Poetry Review, Callaloo, The New Yorker, Ploughshares, Poetry, Tin House, and in Best American Poetry. He is a recipient of a Pushcart Prize, a Whiting Writers’ Award, and has been honored by the Pew Fellowship in the Arts and the Witter Bynner Foundation in conjunction with the Library of Congress. This breakthrough volume appropriates the vernacular notion of “rolling deep” to explore human intimacy and war. 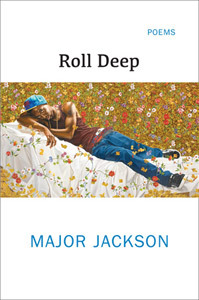 The poems in Roll Deep are whimsical, urbane, and introspective, seeking a rhythmic sound that expresses the realities of the twenty-first century. Whether about child soldiers in Dadaab, a refugee camp in East Kenya, or human intimacy, the poems build community across borders of language and style. over a bed’s edge. We were blown away. beholding electric wires and church spires. Sartre said: man is condemned to be free. on. I hear our prayers rising. I sing to you, now. music, this motionless grip, grimace, and groan. of Pontiacs lining the curb, fade to a hood. meaningless as a trampled box of Cornflakes. crops tended south, the city its own bitter shrine. and shakes root-dirt that snaps like a shadow lost in time. my pen takes aim from the thumbnail of his yard.